Bitter melon(Momordica charantia) is an annual vine that is native to tropical areas of Asia. The flesh has a characteristic bitterness, making it unpalatable for many people. 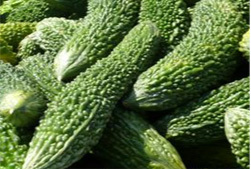 However, bitter melon is known to contain numerous active ingredients and is considered to be a healthy vegetable with many applications, such as dieting and combating fatigue due to the heat. These bitter melon ingredients are directly powdered and made into “Bizen Bitter melon Juice Powder”. Diabetes is a disease characterized by a decreased response of the body to insulin, causing elevated blood glucose levels and chronic hyperglycemia. Diabetes is caused by various factors, and is broadly divided into 4 main types. Among the Japanese population, 90% of diabetes cases are classified as "type II diabetes," which results primarily from lifestyle-related factors. Once a person becomes diabetic, it is difficult to completely recover and the number of diabetes cases is increasing yearly. Studies performed in humans and other animals show that Bitter melon is effective at inhibiting elevation of postprandial blood glucose. Rats given Bitter melon had significantly reduced increases in blood glucose and insulin levels following sucrose administration. This effect was caused by the inhibition of sucrose degradation by the suppression of disaccharide catabolic enzyme activity. In studies in humans, Bitter melon also suppressed blood glucose and insulin level elevation following intake of sucrose, further supporting Bitter melon's inhibiting effects on blood glucose elevation. At Bizen, we offer bitter melon juice powder Extract made from bitter melon grown in the calm climate of Miyazaki Prefecture. 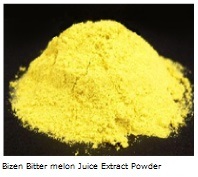 We use 100% domestic Miyazaki Prefecture bitter melon as the raw material for making our bitter melon juice Extract powder, allowing us to provide a safer, more reliable product.